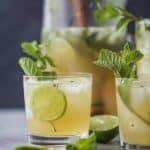 This Classic Mojito Recipe made in a pitcher will be the hit of the party! It’s easy, light and super refreshing for the summer! To a large pitcher add coconut sugar and fresh mint leaves. Add in fresh lime juice and white rum. Stir to mix everything together. Serve with fresh mint leaves and lime wedges.